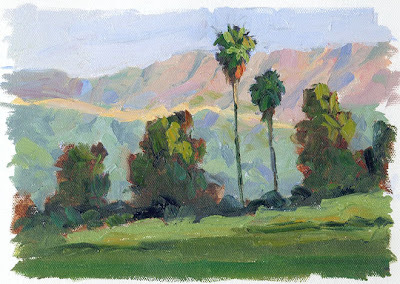 During a recent trip to Santa Barbara I painted this view from the balcony outside our motel room while waiting for my wife to dress for breakfast one morning. What a view! 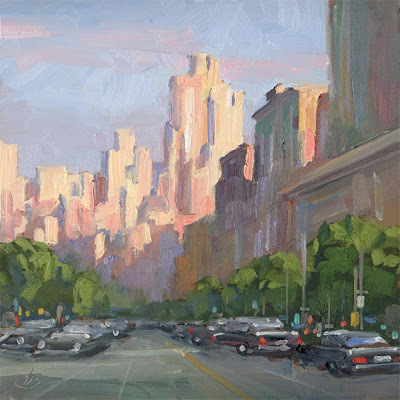 This painting demonstration is for artists and non-artists alike. Today I invite you to look over my shoulder as I paint on location. I hope you’ll find it interesting whether you are an artist or not. 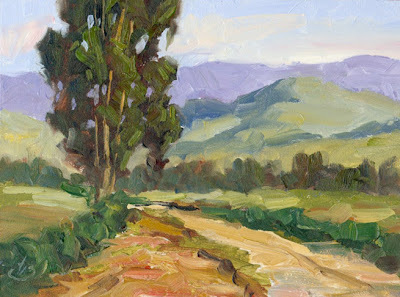 This old country road spoke to me with its charm and I couldn’t wait to paint it. 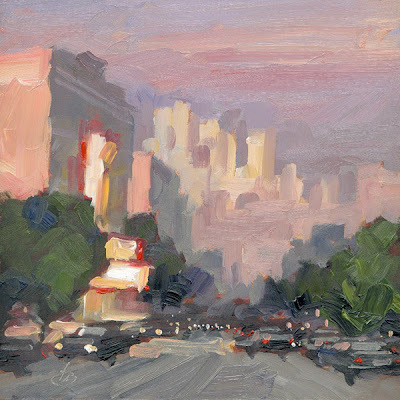 I pulled off the road and got out the $20 pochade box that I show in my CD on PLEIN AIR PAINTING. I like to begin paintings by sketching the large shapes, and stating the darkest darks so I can judge other values as I work. Then I quickly “capture the fugitives” (anything that is likely to escape while I’m painting). In this case the clouds were moving rapidly and they added a lot to the scene, so I wanted to capture them as soon as possible. 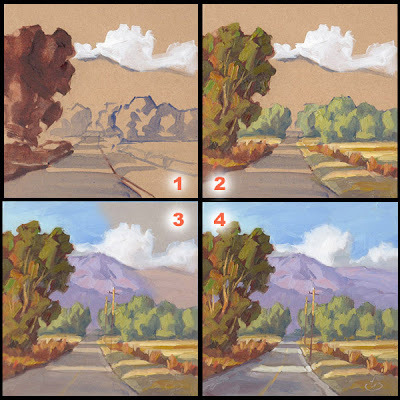 I chose a toned panel for this piece so that I could paint the clouds immediately after sketching the scene (see step 1). This isn’t possible on a white canvas and I couldn’t afford to wait. With that critical element resolved, I could slow the pace and carefully place the darkest darks (the underpainting for the foreground tree). 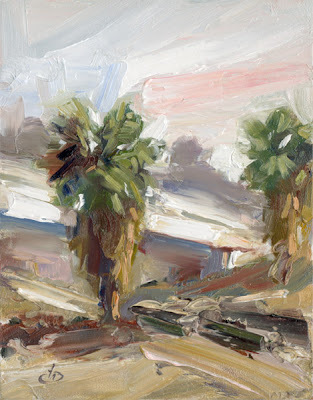 In step 2 I began establishing the spectrum of greens: deep, brownish greens in the foreground tree and lighter, more muted greens in the distance. 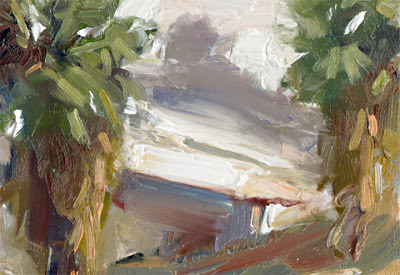 This added considerable charm to the scene as I studied it, and I felt it was important to get the relationship right. That’s the kind of detail that keeps the painting interesting day after day, and year after year. Collectors of my work have commented that there is always something new and special to discover in my paintings because of this. In step 3 broad areas of color and value were established for the mountains and sky. As I mixed and compared these colors with each other I was careful to assess their relationship to all other areas of the composition. 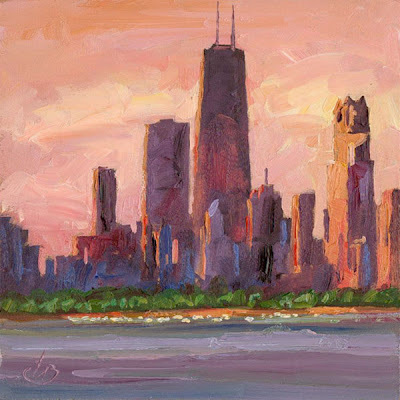 Any spot of color in a successful painting needs to work with all other areas of color. As I moved into the final stage (step 4) I made sure to echo the most important colors throughout the entire painting. 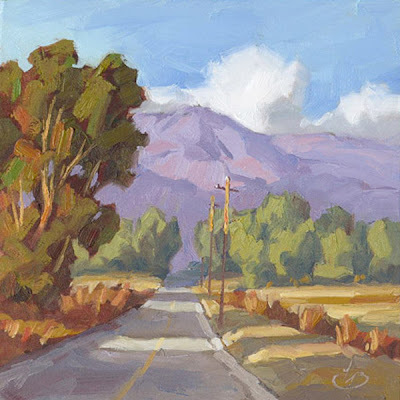 For example the colors of the mountain range are echoed in the shadows across the roadway. 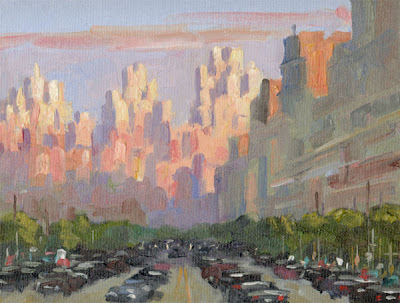 This helps create what I call “color continuity,” and unifies the entire painting so that all parts work well together. As I brought the painting to completion I carefully added what I call “spots of magic” here and there. For example, notice the accents of color and light on the tree limbs at the left. These may seem like minor details, but they are very important. This is the kind of thing that makes a viewer fall in love with a painting every time they study it. Finally I scrutinized the painting one more time and decided it was time to sign it. Done! 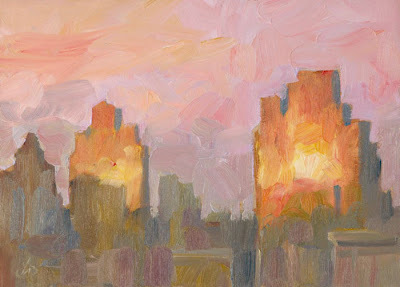 The second viewing distance is when the painting is seen up close. When someone spots your painting and hurries over to study it more closely, they should find additional layers of “close-up charm” that create unexpected magic. This is the result of brushwork, color, surface texture and many other factors. 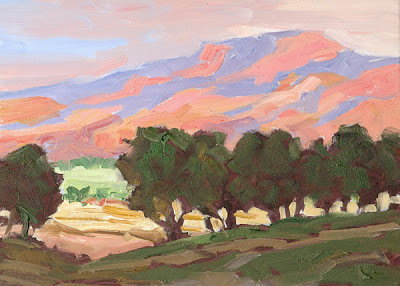 This keeps a viewer coming back again and again to savor your painting. Pay careful attention to this. Collectors will love you (and your work) for it. The fine print: If you want to buy this painting or if you want to buy my CD on PLEIN AIR PAINTING, email me for payment details. I accept PayPal and personal checks, but I ship only to the U.S.A. Thanks. Oh, and keep an eye on my blog for another free art giveaway next month. You might get lucky! 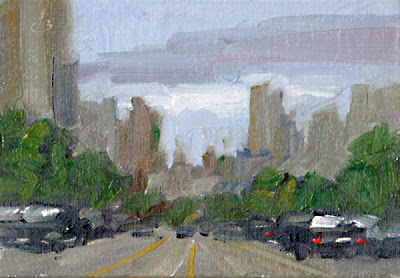 There is something about freeway overpasses that draws me to paint them; I just can’t help myself. For this one I decided to work so loosely that it borders on an abstract. The buildings in the background are merely suggested and there is very little detail anywhere in the painting. I sometimes like this quality of vagueness because it leaves more to the imagination. I am interested in your reaction; let me hear from you. I also have some nice paintings on eBay. Click the headline above and check them out. 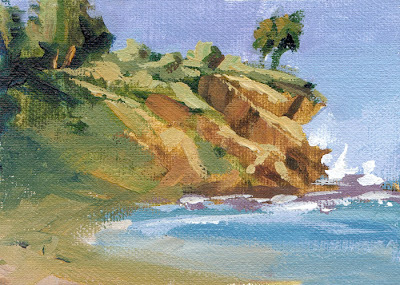 This is the edge of Peter’s Canyon, near the spot where my first Plein Air TV show was filmed. 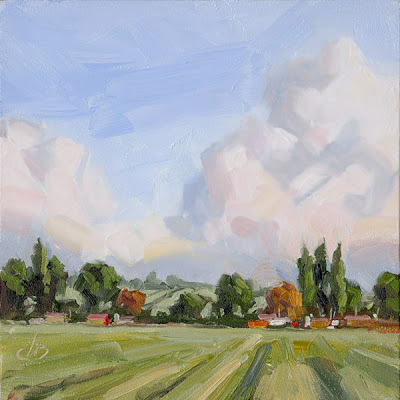 It was painted last Saturday morning as a demonstration during my Plein Air workshop for 20 other artists. During the morning we enjoyed a parade of joggers, walkers (many with delightful dogs), and even a few horse riders along the trail shown in this painting. We had a wonderful time! I want to thank everyone who entered my free art giveaway drawing that was posted on yesterday’s blog. The winning name will be selected this week and the winner will be notified by email. 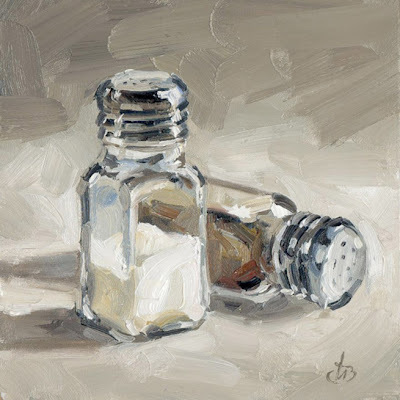 Watch for a comment on my blog from the winner after he or she has received the free painting. Also keep an eye on my blog for a special feature later this month about tips on how to enjoy a successful career as a fine artist. To purchase this painting, email me at tombrownart@gmail.com To see my eBay paintings, click the headline above. 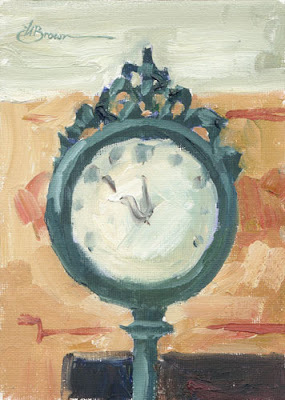 Here’s a reminder: Today is NOT the day, but I will offer a FREE PAINTING GIVEAWAY this month. Keep watching my blog every day. When I post the notice, you will have 24 hours to email me your entry into the free drawing. I am including a snapshot I took on location after completing today’s painting. The clouds had changed quite a bit by then but I wanted to show it anyway. I also thought you might enjoy seeing this painting in one of my handmade frames. 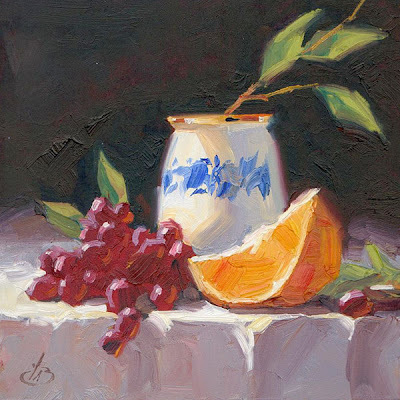 The oil painting measures 6x6 inches, and the framed size is 12x12 inches. I feel the frames give these little gems much more presence on the wall. Today is NOT the day, but I will offer a FREE PAINTING GIVEAWAY this month. Keep watching my blog every day. When I post the notice, you will have 24 hours to email me your entry into the free drawing. Artists frequently ask me for guidance and help with their careers. The answers I give apply to most artists, and include many elements often overlooked or not fully understood by many artists. I am certainly not the ultimate authority, but I have accumulated a good deal of experience and information that may be helpful to others. This comes from selling through top galleries across the country for over 20 years and exchanging information with many top names in the business. 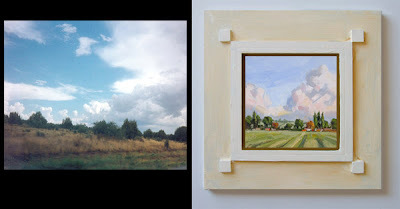 If there is enough general interest I will be happy to post a special blog entry later this month that most daily painters (and even established professionals) could benefit from. Let me hear from you if this is of interest to you. 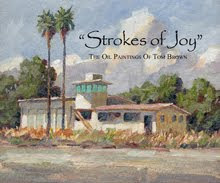 To see my eBay paintings, click the headline above. If you are interested in a larger painting for your home or office, I would be pleased to discuss it with you. 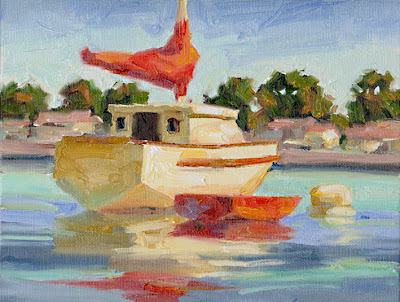 I generally offer small plein air paintings like this online, but I often work in larger sizes for privately commissioned paintings. 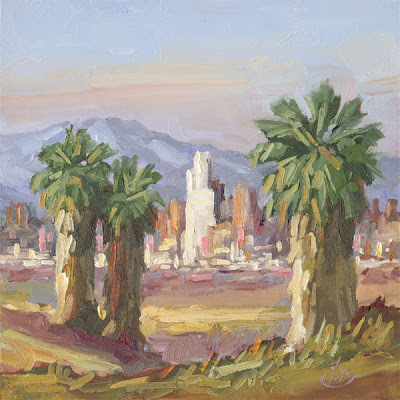 For example I am currently working on a commission for three 30x60-inch paintings that are to be permanently displayed in the lobby of the Irvine Civic Center. I will offer a FREE PAINTING GIVEAWAY this month. I did this a couple of times last year and it was such fun I have decided to do it again. Someone will win a gallery quality painting from my blog absolutely FREE. It could be you. Even shipping is free; there are no strings attached. Here’s how it works: Keep watching my blog every day. When I post the notice, you will have 24 hours to email me your entry into the free drawing. You cannot email your entry in advance; it must be within 24 hours of the notice on my blog. Here’s a tip: it could be ANY DAY during the month so keep watching. Free contests with no strings attached.